Backing up in native format is one of key features of Handy Backup. When most of backup utilities keep data copies in specialized formats requiring restoration of a particular copy for using data again, Handy Backup just copies all files and folders. Data saved in native formats can be used as any other files of these formats. You can open these files, edit and modify. The particular backup content is always obvious. You see what files and folders you keep in your backups. You can use backups as input data for other apps or back up data created by other software without stopping the workflow. Finding and sorting backup files with all comfort provided by standard file managing tools. No dedicated task or software required to restore just one or two files from backup. Copy files wherever you want. Backups can be used for mirroring or replicating data without any extra effort. Just copy backup to any place and use it. Back up in native format is a default option for Handy Backup. To choose another form of data keeping you must specify compression and/or encryption of data. When the backup task is complete, a copy of your data set appears in your chosen destination. You may process this data copy as any other directory or data set using file managing tools or dedicated software for manipulating with these data types. 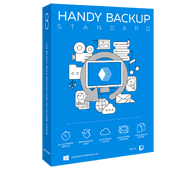 Discover the power of Handy Backup using Standard Edition for protecting your personal data in native formats! Free 30-days trial version! When I Do Not Need Backing up Data in Native Format? 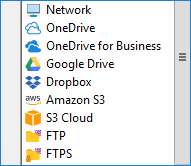 You can choose options for compressing and encrypting data to save space on data-storage media selected for backups, or to send data backed up far away using open networks. Compression and encryption can minimize both size and time of backing up, as well as add a bit for overall security. I am no computer whiz so I like the idea of the files being backed in their own format without too much fuss.